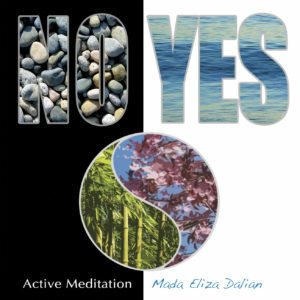 A favourite of many, the No-Yes is a powerful active meditation technique to help detoxify the body of repressed negative emotions, anxiety, and stress, allowing the practitioner to experience inner peace, clarity, and joy of living. Throughout life we continually say “Yes” to people and situations even when we feel like saying “No.” When we repress our true feelings, we become artificial and create tension and stress for ourselves and others. In this way, we stop ourselves from living and experiencing life fully and authentically. If you have felt like saying No but kept saying Yes to people and situations because you were afraid to be impolite, hurt others’ feelings, or be rejected, the No-Yes Active Meditation will help you to quickly and safely release your repressed negative emotions and transform them into authentic Yes to yourself and life. This is a powerful at-home practice for those who strive to understand themselves, de-stress, and dis-identify from their mind and emotions. Enhance the feeling of peace and presence in the Now! The instructions and music on the CD are specifically designed to bring to the surface the emotions repressed in the body’s cellular memory and transform them into higher vibration of understanding, love, forgiveness, and compassion for self and others. Even occasional practice with this unique technique will help you feel good about yourself, others, and life and experience the authentic Yes that resides within the depth of your being. Note: This meditation is also an excellent tool for anger management consultants, counselors and psychologists when recommending self-help tools to their clients or working with them in a group setting. Mada Eliza Dalian is a self-realized mystic, internationally acclaimed master healer, spiritual teacher, best-selling award-winning author, and the founder of the evolutionary Dalian Method™. Mada’s quest for truth began at the age of five when she witnessed her grandfather’s death and started asking herself: Who am I? Where do I come from? Where will I go when I die? At the age of twenty-four, she left behind her training in education and architecture and devoted herself to the search for truth and spiritual enlightenment. After years of meditation and searching for truth, she was blessed with several profound experiences that ultimately lead to a powerful awakening at the age of thirty-three. Mada is like a human X-ray machine who, with razor-sharp accuracy, is able to see through the layers of people’s unconscious, read the repressed belief patterns in their bodies that cause pain and suffering, and help transform what is unconscious in the person into consciousness. In 1991, while reading one of Osho’s darshan diaries (talks transcribed from his intimate meetings with disciples), I came across a suggestion he made to a woman to help transform her negative thoughts into positive and balance her energies. He suggested she repeatedly say “No” for forty minutes and then switch to saying “Yes” for twenty minutes. I felt the wisdom and the power behind his advice and was inspired to experiment with it myself and in my groups. The results were amazingly transformative. I saw how quickly people were able to access and release the multiple layers of suppressed negative emotions like anger, resentment, sadness, blame, and judgments, and transform them into self-acceptance, love, gratitude, and joy without needing to engage their mind in any psychological activity. I quickly noticed, however, that most people were having difficulty switching immediately from “No” to “Yes.” I realized that, similar to the gap that exists between the incoming and the outgoing breaths, a small transition stage of stillness and silence was necessary to help shift gears between these contradictory stages. After adding this gap (which I’m sure Osho would have added had he experimented with his suggestion further) a new meditation was born. I then spent almost a year working with a musician on the “No” phase of the meditation to create the vibrations needed to bring to the surface what has been repressed in the body, so it can be easily released and transformed into self acceptance, understanding, trust and celebration of one’s own life. This meditation is dedicated to Osho and his work.